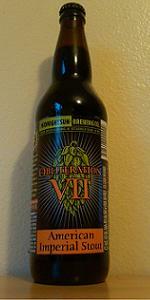 Home Beers Midnight Sun Brewing Co.
Obliteration VII | Midnight Sun Brewing Co.
A: Black with a creamy brown head. S: Earthy dark roast coffee and dark bittersweet chocolate in the nose. T: Espresso, dark roast coffee, dark chocolate. Surprisingly not bitter. M: Full bodied and quite smooth. O: I had this about a year after it came out, and I would imagine it was supposed to be hoppy, but it wasn't. That said, it was delicious. A - Dark black with a finger of frothy khaki-chocolate colored head. Fades normal. S - Roasted dark chocolate and caramel malts, cocoa, black licorice, molasses, coffee, earthy hops, vanilla, bit of dark fruit, and a bit of booze. T - Roasted dark chocolate and caramel malts, bitter cocoa, black licorice, molasses, roasted coffee, earth hops and some bitterness, some dark fruit, vanilla, and a bit of booze. M - Full bodied, moderate carbonation. Smooth and a bit thick with a sweet, roasted, bitter, and warming finish. D - Nice imperial stout. Good overall balance and complexity. From notes, 2/25/11. Chocolate and grapefruit pith. This is an interesting beer - you don’t come across super hoppy imperial stouts all that often - but it’s not really an enjoyable beer. The underlying stout seems really nice, but it’s almost completely overshadowed by the citric bitterness of the hops. This is more a problem for the taste; the aroma actually blends nicely and is quite nice. Mouthfeel is a bit astringent. The beer is black with a small tan head. 22oz bomber purchased at Bottles, in Millwood, Washington, quite some time ago. According to the label, it was bottled the first week of December, but no year is mentioned. 2011? 2010(egad!)? Poured a very dark brown of impressive viscosity, with a large, tan head that left lots of lace on the sides of a nonic pint glass. Said head took it’s time dropping. Big, big aroma of brown sugar, raisins, coffee and tobacco. Surprising how much of a nose there is for a beer that is more than (at least) a year old. The taste is an even match of sweet and bitter, with the bitter receeding slightly as things go on, but never going away. There’s also a nice milk chocolaty thing happening in mid-taste that lends variety and balance without becoming too sweet. According to the label, this beer has 100 IBUs, and hops don’t seem to have faded too much, with a nice, dry zap to the palate at the swallow. The body is somewhere between medium and full, with a creamy, sticky mouthfeel. Carbonation is right where it needs to be. Although I was taken aback to see how long I’d let this bottle sit, it seems to have aged rather gracefully. I just wish I’d had one when it was fresh for the sake of comparison. 22oz bottle sent to me by Coby. Must be going on 2 years old now (bottled near the end of 2010, I think). A: Pours an inky jet black with a creamy light tan head. Lots of nice lacing. S: A lot of piney hop, thick roasted malts, chocolate, citrus. T: Sharp bite of smokey, charred bitterness. Aging yet still strong hop notes, coffee and mild caramel sweetness. O: The charred notes are a bit too harsh. I don't think any amount of age is going to calm this beer down. This was opened at the August Baltimore BA tasting. Poured from the bottle into a snifter. Appearance: Pours almost black with some red at the edges. There is a layer of off white head that leaves a ring around the pour. Smell: Sweet and roasty. Mild chocolate and caramel notes behind the roast. I'm also getting some hops and dark fruit. Taste: Really roasty and quite hoppy. Caramel in the background with some dark fruit. The hops and roast get together and make the finish super bitter. Mouthfeel: The body is a bit syrupy with a medium amount of carbonation and a finish that is just a bit dry. Overall: This was a good enough beer, really intense. I might have it again if I was given the opportunity. Review from 12/2010 notes. Poured into a Nostradamus flute glass. Pours a dark red amber, appearing black in the glass. Aroma of sweet and roasted malt and hops. Hoppy start followed by light toasted malts, coffee and light fruits. Finishes astringent and bitter. Nice flavors, but the finish is not well integrated with the other flavors and the hops are not aromatic enough to counter the dry bitter finish. Decent, but not great. Bottle: Poured a pitch-black color stout with a nice thick dark brown foamy head with good retention and some lacing. Aroma of dry roasted malt with some medium dry hops notes. Taste is a mix between some deep roasted malt with some pretty astringent hops which doesn’t make me want to drink too much of this beer. Body is full with great carbonation and no apparent alcohol. I understand this is an experiment but not sure I am a big fan of Magnum and Warrior hops which are too astringent. Obliteration VII from Midnight Sun Brewing Co.